REMZZZS CPAP MASK LINERS (FULL FACE) :: CPAP / Bilevel PAP :: Naturs Design, Inc.
you may know, CPAP therapy hasn't always been therapeutic for some people. Fortunately, that was before RemZzzs. You can think of it like this: RemZzzs will help you and your mask become friends. This is possible because our patent pending design acts as a barrier between the skin of your face and the silicone of your mask's cushion, virtually eliminating all of the most common problems associated with wearing a CPAP mask.And best of all, it's very comfortable!! But comfort is just the tip of the iceberg. Read the list below to see just some of the amazing benefits of RemZzzs CPAP mask liners. Promote a comfortable, full night of sleep...for you and your partner! 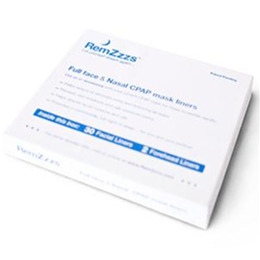 RemZzzs CPAP mask liners are available either Full Face or Nasal type, and are shaped to fit many of the most popular CPAP mask models. PLEASE NOTE: A single pack is designed to supply ONE individual for ONE month. Packs contain 30 facial liners and 2 forehead liners.